There is a reason why so many people choose to rent homes near Stratton every year. This beautiful region has world-class skiing and riding, excellent restaurants, shopping and more! Wohler Realty Group is the local leader in Stratton area rentals. Our team has lived and worked here for years, so we have an in-depth knowledge of the different neighborhoods and rental opportunities. If you have questions about renting homes near Stratton, please don't hesitate to contact us. Get Ahead: Register to receive custom updates when similar properties become available. ·Resort Home ·Trailside and Shuttle Access ·5 Bedroom Suites and 5.5 Bathrooms ·Sleeps 14 ·1 King ·2 Queen ·2 Twins ·3 Bunk Sets ·2 Fireplaces ·Loft & Deck ·Hot Tub & Garage ·Ski Room/Mudroom ·Sport Center Access Spacious ski home conveniently located trailside with access to winter shuttle. Beautifully designed with charming finishes that make the home feel bright and warm. Features 5 bedrooms, 5.5 bathrooms, 2 gorgeous stone fireplaces, and mudroom. Plenty of room for entertaining with loft, large deck, and hot tub. A cozy home that you can relax in after a long day of skiing. I have a question about the property at Stratton Mountain Ski Home Stratton Mountain VT (#X93077709). 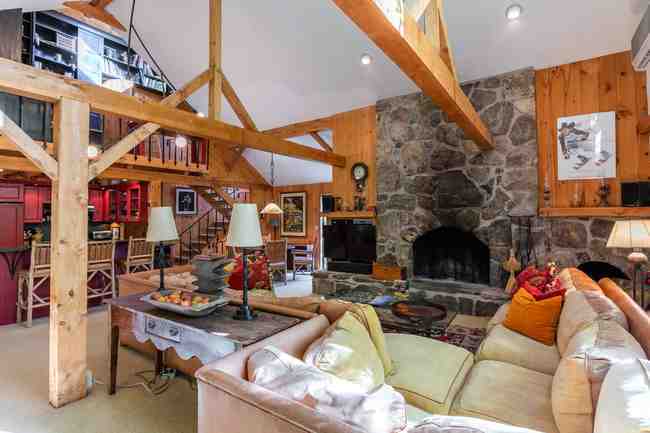 I would like to schedule a visit for the property at Stratton Mountain Ski Home Stratton Mountain VT (#X93077709). •Resort House •Shuttle Service •Great Room •2 Story Fireplace •Gourmet Kitchen & Dining Room •Media and Billiard Room •Mudroom/Ski Storage •Hot Tub •Sauna & Spa •Garage •5 Bedrooms & 7 Bathrooms •2 Kings •1 Queen •2 Twins •2 Bunk Sets •Sleeps 12 Extraordinary Stratton Resort Residence with direct views of the mountain from every vantage point! One of the most distinctive and admired properties on the Resort, the architectural features - with grand spaces, cathedral ceilings and open floor plan - make it ideal for entertaining during ski season. Situated along the Stratton golf course, you'll enjoy direct access to snow shoeing and sledding from your doorstep. Designed with mountain living at the forefront, you'll enjoy winter recreation and return home to hot tub, sauna, spa and apres ski enjoyment in the media and billiard room. Gourmet kitchen, breakfast/butler pantry and dining room. Sunken great room with two story hearth and Rumford fireplace creates a dramatic focal point. Exceptional en suite master, walk-in closet/dressing room and private office and more VIEWS. Great attention to detail throughout. This 6,275 SF residence features 5 bedrooms and 7 baths. Well designed mudroom/ski room and attached 2 car garage provides the space for your equipment and toys for winter. 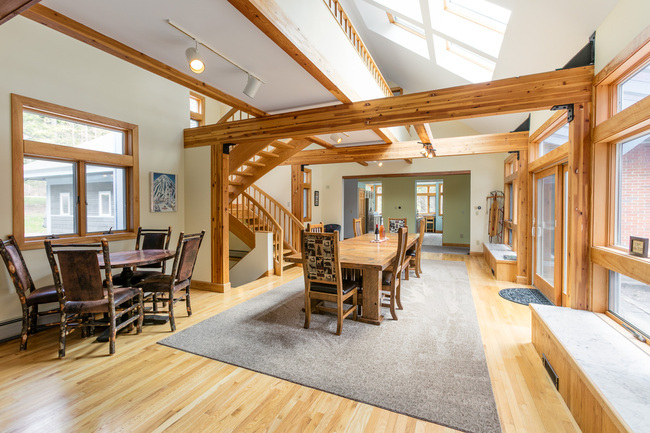 This turn key residence offers what you look for in your Vermont winter getaway with VIEWS, VIEWS, VIEWS! Shuttle stops at your driveway and will take you to the Base Lodge, only a few minutes away. Make this exceptional residence your ski home this season and enjoy everything the resort has to offer! I have a question about the property at Stratton Resort Residence Stratton VT (#X68961442). I would like to schedule a visit for the property at Stratton Resort Residence Stratton VT (#X68961442). • House • Resort Location • 4 Bedrooms and 4 Bathrooms • 2 Kings • 4 Bunk Sets • Sleeps 12 • Shuttle • 2 Fireplaces • 3 TV’s • Garage • Grill The resort neighborhood of High Meadow has winter holidiay and weekend shuttle service to the Base Lodge, directly from each owner’s dirveway and Stratton Sport Center Access. This luxury ski house with spacious open concept floor plan features a living room and gameroom, each with wood-burning fireplace and perfect for apres ski. The spacious kitchen offers a wonderful island and large dining area. The residence comfortably sleeps 12 with two masters en suite that occupy the top floor and 2 bunk rooms. The shuttle picks you up at your driveway and guest passes are available to the Stratton Sports Center. Great house with everything you look for in a winter residence. 2 car Garage, mudroom and ski storage. 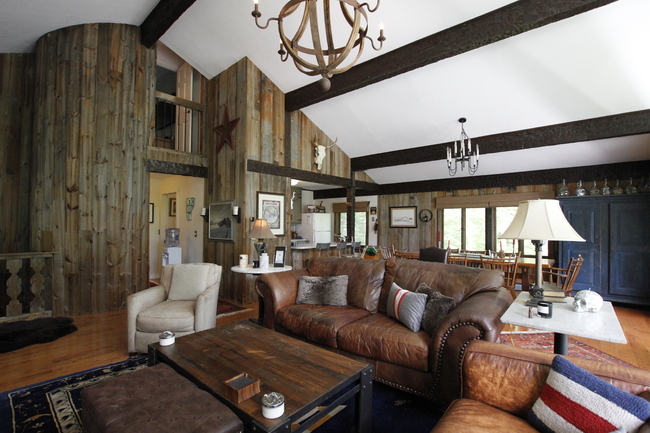 I have a question about the property at High Meadow Luxury Stratton VT (#X54384128). I would like to schedule a visit for the property at High Meadow Luxury Stratton VT (#X54384128). • House • Resort Location • 4 Bedrooms • 5 Queens • 2 Twins • Sleeps 12 • Shuttle • Wood-Burning Fireplace • Garage • Sports Center Access If you’re looking for a great resort location then look no further. This stunning resort home sleeps 12 very comfortably and has a wide-open floor plan. Vaulted ceilings, Rumford wood-burning fireplace, wood floors throughout, and a kitchen that opens to the dining area and great room. The living room has amazing natural light; the entire house is vibrant. 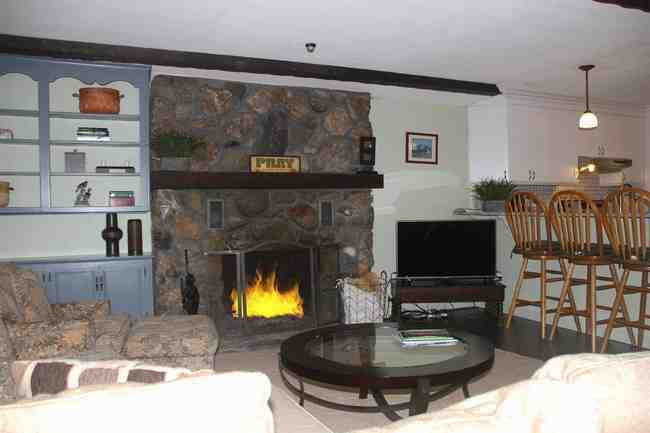 The lower level family room offers another space for enjoying après ski or a good movie. The shuttle picks you up at your driveway and the location is not far from the Wanderer Trail, where the shuttle can drop you off or take you to the Base Lodge. Sports Center access. I have a question about the property at North Brookwood Stratton VT (#X90813491). I would like to schedule a visit for the property at North Brookwood Stratton VT (#X90813491). ·Resort House ·5 Bedrooms and 4 Bathrooms ·1 King ·1 Queen ·2 Twins ·2 Queen Bunk Sets ·2 Wood Burning Fireplaces ·Shuttle Access ·Hot Tub ·Sport Center Access This lovely resort home is located close to the slopes in one of Stratton’s most desired neighborhoods. With shuttle service during the winter, you can enjoy ease and convenience to the mountain for the entire family and friends. This residence offers extraordinary space with five bedrooms, 4 bathrooms, family room, spacious mudroom, outdoor fire pit and hot tub. It’s the perfect ski home for entertaining and relaxing. I have a question about the property at North Brookwood Stratton VT (#X91438730). I would like to schedule a visit for the property at North Brookwood Stratton VT (#X91438730). •Resort Home •Mountain Views •Upscale Finishes •Stone Fireplace •Gourmet Kitchen •Great Room •Mudroom •Deck •Garage •4 Bedrooms & 5 Bathrooms •1 King •2 Queens •2 Twins •Sleeps 8 Exceptional new construction is five star energy rated with upscale finishes and unobstructed views of Bromley and the ridge lines. 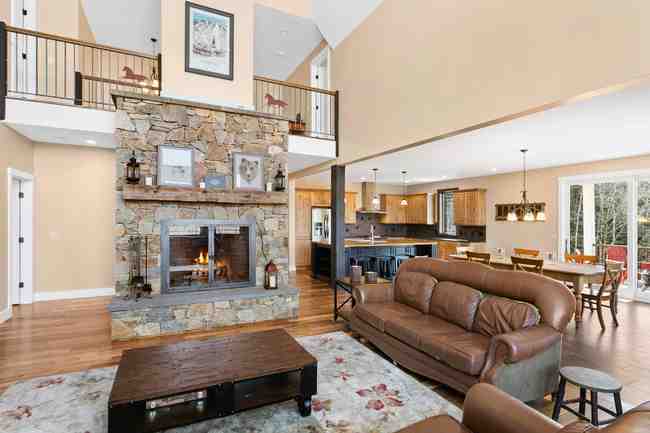 Just minutes to the Stratton Base Lodge, this beautiful residence boasts a gourmet kitchen with Wolf gas range, wood floors throughout, a commanding 2 story stone fireplace and VIEWS, VIEWS, VIEWS! No detail has been overlooked featuring four en-suite bedrooms with exceptional tile finishes and oversized showers in the main master suites. The welcoming entrance includes a well designed mudroom with direct access to the oversized 2 car garage. The deck is perfectly situated to take in the views and enjoy the beautiful surroundings. 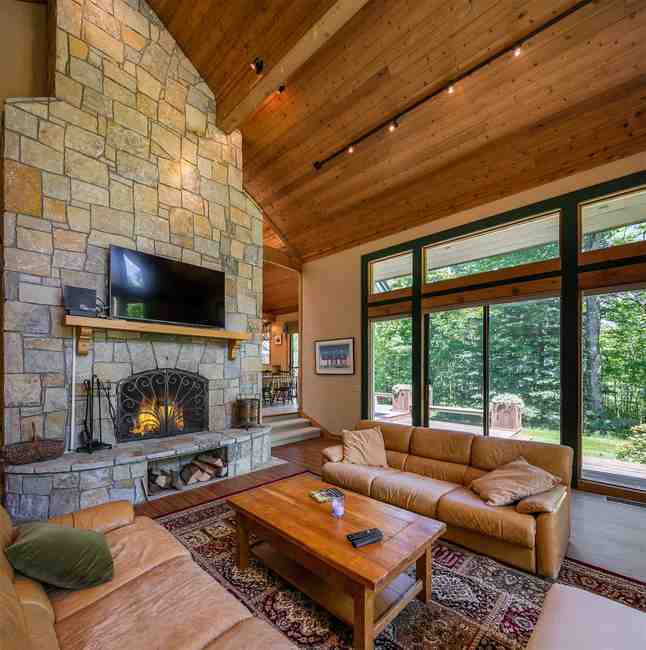 Don't overlook this turnkey gem, just minutes to the Stratton trails with everything you look for in mountain residence. This new construction is what you have been looking for. It's time to make it yours this winter! I have a question about the property at Stone Lodge Stratton VT (#X82290866). I would like to schedule a visit for the property at Stone Lodge Stratton VT (#X82290866). •House •Resort Location •Shuttle Service •2 Wood Burning Fireplaces •2 Kitchens •Mudroom •Great Room •Family Room •4 Bedrooms & 3 Bathrooms •2 Queens •2 Twins •2 Twin Bunk Sets •Sleeps 10 Experience a wonderful Stratton winter in this Chalet-style home, located minutes from the Base Lodge. The residence features 2 updated kitchens, large mudroom, great room, and family room. With 4 bedrooms that sleep a total of 10 and 3 bathrooms, you'll have plenty of room to entertain friends and family. Be brought to and from the Base Lodge by the Shuttle Service all season long! 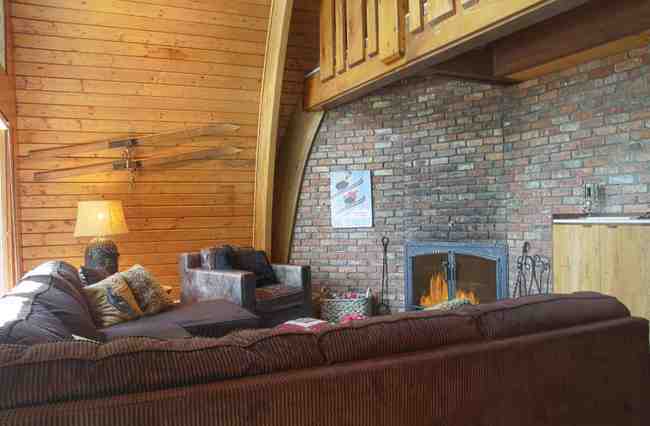 And after a great powder day, you can relax by either of the 2 wood burning fireplaces. Why wait? It's time to make this your winter ski home today. I have a question about the property at Quarter Mile House Stratton VT (#X86219100). I would like to schedule a visit for the property at Quarter Mile House Stratton VT (#X86219100). •Resort House •Billiard Table •3 Wood Burning Fireplaces •Loft •Family/Game Room •Deck & Grill •Ski Room •5 Bedrooms & 3.5 Bathrooms •1 King •2 Queens •1 Full •2 Twins •Sleeps 10 Experience a Stratton winter in this amazing home located in Stratton Acres - only a short drive to the Main Base Lodge or the Sun Bowl. 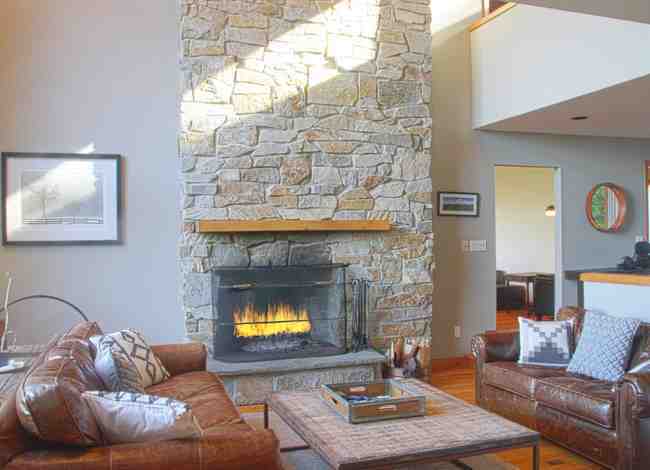 The residence offers plenty with a large kitchen & dining area, great room with stone hearth & fireplace, family/game room. 5 bedrooms, 3.5 bathrooms, loft, deck & grill, and VIEWS. With entertaining in mind, the lower level holds a gym and gathering area with TV, pool table, fireplace, and bar. Don't wait, make this your winter ski home today! I have a question about the property at Benson Fuller Stratton VT (#X14519796). I would like to schedule a visit for the property at Benson Fuller Stratton VT (#X14519796). SHUTTLE OUTDOOR HOT TUB 4 BEDROOMS/3 BATHS+ Recreation room with bunks SLEEPS 12 2 Kings 2 Queens BunkBeds WOOD BURNING FIREPLACE GOURMET KITCHEN CATHEDRAL CEILINGS This quintessential mountain ski house is ideally located on the North Brookwood shuttle and offers a wonderful ambiance that you will enjoy all winter. Cathedral ceilings, wood burning fireplace, gourmet kitchen. Two masters with King beds, two additional guest rooms plus a recreation room with built in bunks provides plenty of room for family and friends, After a day on the snow covered trails, you'll enjoy apres ski in the outdoor hot tub, entertaining with a great kitchen and cozying up before the roaring hearth. Take the shuttle to the Snowbridge covered bridge and ski down on the Wanderer Trail, or ride to the Base Lodge and Village from this premier neighborhood and location. This is a great ski house! I have a question about the property at North Brookwood Stratton VT (#X41358174). I would like to schedule a visit for the property at North Brookwood Stratton VT (#X41358174).